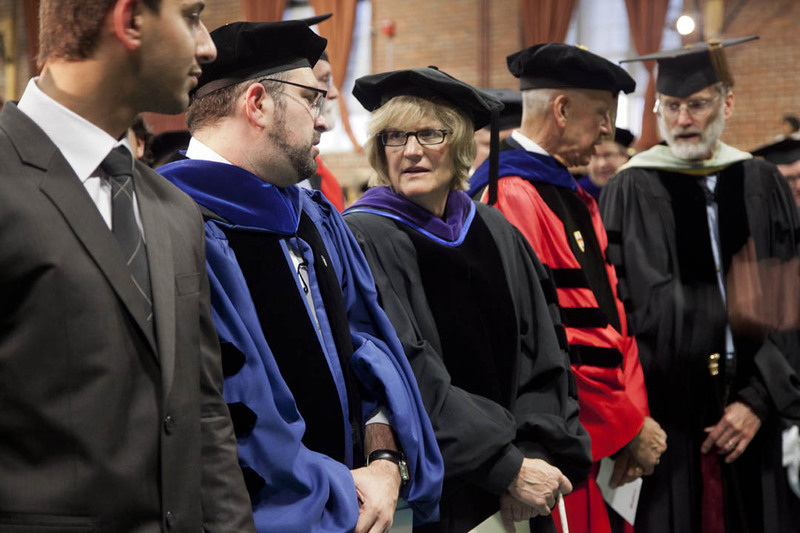 From left, Convocation speakers Umar Khan ’13, professor Stephen Engel and Bates President Clayton Spencer chat prior to Convocation 2012. Also shown are professors Sawyer Sylvester and Thomas Tracy. Photograph by Phyllis Graber Jensen/Bates College. Welcome back, faculty, staff and returning students, to the beginning of a new year. And welcome, Class of 2016, to the Bates community. As I mentioned to you on Saturday, I feel a special bond with you, as I am a first-year as well. I look forward to taking stock, along around May 2016, to see how we’ve all fared over these next four years. I gather that presidents have sometimes used this occasion to outline an institutional agenda for the year. I will have other opportunities to do that this fall, so I plan to address today’s remarks to the first-year class. Like Steven Engel, I will take as my point of departure our assigned reading, The Spirit of Compromise, by Amy Gutmann and Dennis Thompson. As I read the book, I could not help but be transported back to the three and a half years I spent working, when I was in my 30s, for one of the great compromisers of all times – Senator Ted Kennedy. For many, the mention of Kennedy’s name conjures the image of a fiery ideologue – the very embodiment of the word “liberal” used as a pejorative term. It is precisely this willingness to compromise in order to improve on the status quo that Gutmann and Thompson write about, bemoaning its increasing absence from our democratic processes. So I thought I would share with you three vignettes about how compromise played out in the legislative process before my very eyes. My point is not to tell war stories, but rather to share lessons I learned as a young person from a truly amazing mentor. I’ve told this story before because it was a true epiphany for me. In 1993, I was hired as an education staffer for the Senate Committee on Labor and Human Resources, of which Senator Kennedy was chairman. Think of it as the “social safety net committee,” through which health, education, labor and welfare legislation moved. Bill Clinton was president and Democrats controlled both the House and the Senate. In education, our job was to get President Clinton’s ambitious agenda through Congress. In higher education, the priority was revamping the federal student loan program. The goal was to move from a system where banks, backed by state guarantee agencies, financed student loans to a system in which the government would lend money directly to students, with the loans processed by the colleges and universities themselves. The tricky part was that the banks and guarantee agencies made lots of money off the old system, and they had lobbyists crawling all over Capitol Hill fighting the new measure tooth and nail. In my very first days on the job, I was asked to brief Senator Kennedy on how we were going to get this “direct lending” legislation passed and how fast the new system would be “phased in.” Now, I’ve always been good at school, particularly writing papers. It’s the only thing, really, that I’ve ever been any good at. So I wrote a doozy of a briefing, explaining in no uncertain terms that we should of course go to 100 percent direct lending as quickly as possible because it would eliminate the middle men in the student loan industry and save students and taxpayers billions of dollars — $3.8 billion for the taxpayers, if I remember correctly. I was summoned to the Senator’s office. I had only met him once before, during my job interview. I should have figured out that something was up when I arrived in the office to find the Senator ensconced in his big leather wing chair, surrounded by his top policy aide, the Labor Committee chief of staff, his personal office chief of staff and assorted onlookers. “Clayton,” Ted Kennedy said, “This is a very good briefing. Very thorough, truly excellent analysis. I guess this whole direct lending thing is more or less a ‘no brainer’. “Votes?” I stammered. It hadn’t occurred to me to worry about votes if one had the right answer. “Let’s take a little walk,” says Kennedy, and he escorts me down the hall to the office of Jim Jeffords, then the Republican senator from Vermont and an important swing vote on our committee. So we walk in, Kennedy introduces me, and he asks Jeffords to tell me how many votes he reckons we have on the Republican side to get this “direct lending thing” out of committee. Incidentally, we never got to 100 percent direct lending during that time. The committee voted a phase-in over four years to 60 percent . Lesson learned? Effective compromise involves personal relationships, flexibility and a sense of timing. So, students, as you work through your roommate issues, conflicts with your team or coach, or the inevitable bumps and dents of adjusting to a new community, remember that there are times to take a walk down the hall, to approach things face-to-face and to figure out when the moment is right moment to press a point. Fast forward to the mid-term elections of 1994 – probably the year many of you first years were born! In a coast-to-coast shellacking, the Democrats lost control of Congress – the first time Republicans had taken the House in 40 years. Newt Gingrich came in as Speaker of the House brandishing the “Contract with America” – a sweeping legislative agenda with many facets. But one of its main points was to shrink government and slash spending – including spending on education. During this same midterm election, Senator Kennedy had a tough race, which didn’t often happen in Massachusetts, against a Republican named Mitt Romney. All of us staffers had gone up to Massachusetts for the election, and we gathered in the Park Plaza Hotel for the victory party. We were of course thrilled that Kennedy had won, but the evening was bittersweet, because as we watched the state after state flip from blue to red, we realized that we had just gone from being the majority to the minority party, we would lose half our staff and the job of getting Clinton’s agenda through Congress had just become a whole lot harder. Kennedy, though, didn’t miss a beat. Since the new Republican majority was all about budget-cutting, he knew that they would have to cut some pretty popular programs – like Head Start, like aid to elementary schools, like student financial aid. Trouble was that the Clinton administration, in its zeal to be fiscally responsible, had written a budget that also called for cuts to education programs. So Kennedy called the Secretary of Education, asked him to rewrite the education budget and eliminate all cuts, and then began a relentless crusade in the Senate called “Not One Dime From Students.” It featured, among other capers, packing the first Republican hearing on student aid with busloads of college students shipped in from Massachusetts. Lesson learned? The facts on the ground had changed, so it was time not for compromise, but to shift the strategic frame in which future compromise would happen. So, as you move through life at Bates over these next four years, always keep your larger goals in mind and remember that you have to step back sometimes to reframe a problem in order to make progress. At some point in my work for Senator Kennedy, we had an education bill going to the floor, and Kennedy, as chair, had to manage it. The main thing Kennedy wanted us to do as staff was to make sure that we “got rid of” amendments before bills went to the floor – otherwise, the debate on the bill would be framed not by us, but by others, often of the opposing party, standing up to push their amendments. So for this particular piece of legislation – I don’t even remember what the bill was – I had spent days negotiating away most of the amendments. But I couldn’t get rid of one amendment being offered by a Republican senator, whom I won’t name, that aimed to prevent violence in schools. I was told by this senator’s staff that they would not negotiate in advance, because their senator wanted to make sure that he had an opportunity to stand up on the Senate floor, on C-Span, and make his point about school safety. So, the day before our bill was going to the floor I prepared yet another of my razzle-dazzle briefings for Senator Kennedy, outlining our strategy and reviewing the amendments that had been offered and successfully negotiated. Then I noted that this one amendment remained, and Senator Kennedy would simply have to oppose it in the floor debate. Needless to say, I met the senator at quarter of eight. Lesson learned? Everyone – in legislation and in life – has to have a narrative to make sense of what they are doing, and part of working effectively with people is understanding and respecting the narratives of others. So this is a small sample of what I learned about how compromise works in the legislative process. But the more important lessons I learned from this happy warrior were lessons about life and purposeful work. Senator Kennedy was a tireless advocate for improving the life chances of people not born into privilege and the safety net for our most vulnerable citizens. He was a resolute idealist and an exceptionally nimble pragmatist. He was a brilliant strategist and policymaker, and a master at reading people, understanding their motivations and extending himself as a colleague and friend. He was meant to be a senator, and he was lucky enough to figure that out early and throw himself into a career that he approached each and every day with passion, diligence and joy. And with a lot of laughs in the bargain. I have heard creativity described as the “union of passion and rigor”2 — or amore ac studio, as the case may be. This is what I hope for you: That you will use these four years to identify the ideas, values and experiences that light you up, and to equip yourselves with the tools and habits of mind that will allow you to live and work with passion and purpose. There is no higher reward. Now it is my pleasure to turn the podium over to Steve Engel, who has generously agreed to share with us his reflections on the responsibility of a liberal arts education. 1 Kuttner, Robert, “Ted Kennedy: A Liberal’s Bipartisan,” The American Prospect, on-line edition, August 26, 2008. 2 Glier, Michael, Williams College Department of Art, Studio Faculty, “Remarks to a Board of Trustees Retreat,” January, 2006.